The weeping tile (also referred to as weeper or drain tile), can be a worthwhile addition to your home. Many homeowners have used one for waterproofing, especially after having issues with water infiltration. If you want to avoid basement leaks, a weeping tile installation might be just what you are looking for. For the last eight decades or so, weeping tile has been used to drain water that pools around the base of the foundation of your home. The original name for weeping tile was such because it included sections of terra cotta clay pipe. These sections of pipe would allow water to flow (weep) into them, and once the water came into the pipe, the weeping tile system would drain the water away. It remains a prevalent method in use today. Essentially, it boils down to being a simple drainage system that is next to the exterior side of the footing of your foundation walls. The real goal here is to offer a drainage point that would allow the water to be moved away to a sump pump liner or storm sewer beneath your street. If you did not have a weeping tile, the drain that accumulates or pools at the base of your foundation would essentially cause the basement walls to be soaked with puddles of water. Given the porosity of concrete, this is a situation that you want to avoid as much as possible. It does not matter if it is stone, mortar binding blocks, cinderblock, concrete block, or poured concrete, the concrete is going to absorb water. Eventually this is going to lead to the saturation of the concrete or the pooled water will naturally wick through the concrete. This is going to damage and weaken your foundation walls gradually, until there is nothing left to do but repair or replace. 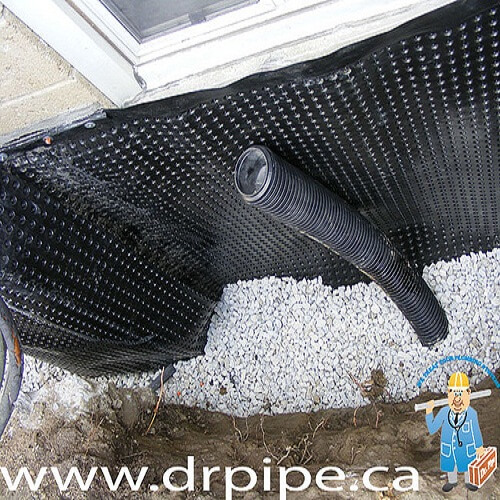 If you are interested in waterproofing your entire foudation (rather than what you see above ground) a weeping tile installation would be a smart choice. Do you need to install new weeping tile? Even though you can enhance footing drainage, installing brand-new weeping tile will not always remedy the problem unless you are working with qualified professionals who know what they are doing. Far too often do people end up wasting money because they are not aware of how to remedy the drainage problem they had. If you want to be sure that installing new weeping tile is going to help, make sure to consult the Hamilton professionals at Dr. Pipe Drain and Plumbing beforehand.